From the creation of newspapers with national reach in the late nineteenth century to the lightning-fast dispatches and debates of today's Internet, the media have played an enormous role in modern American politics. Scholars of political history universally concede the importance of this relationship yet have devoted scant attention to its development during the past century. Even as mass media have largely replaced party organizations as the main vehicles through which politicians communicate with and mobilize citizens, little historical scholarship traces the institutional changes, political organizations, and media structures that underlay this momentous shift. With Media Nation, editors Bruce J. Schulman and Julian E. Zelizer seek to bring the media back to the center of scholarship on the history of the United States since the Progressive Era. The book's revealing case studies examine key moments and questions within the evolution of the media from the early days of print news through the era of television and the Internet, including battles over press freedom in the early twentieth century, the social and cultural history of news reporters at the height of the Cold War, and the U.S. government's abandonment of the Fairness Doctrine and the consequent impact on news production, among others. Although they cover a diverse array of subjects, the book's contributors cohere around several critical ideas, including how elites interact with media, how key policy changes shaped media, and how media institutions play an important role in shaping society's power structure. 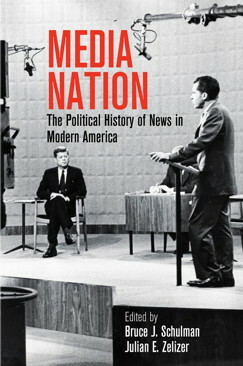 Highlighting some of the most exciting voices in media and political history, Media Nation is a field-shaping volume that offers fresh perspectives on the role of mass media in the evolution of modern American politics. Contributors: Kathryn Cramer Brownell, David Greenberg, Julia Guarneri, Nicole Hemmer, Richard R. John, Sam Lebovic, Kevin Lerner, Kathryn J. McGarr, Matthew Pressman, Emilie Raymond, Michael Schudson, Bruce J. Schulman, Julian E. Zelizer. Bruce J. Schulman is the William E. Huntington Professor of History at Boston University. Julian E. Zelizer is the Malcolm Stevenson Forbes, Class of 1941 Professor of History and Public Affairs at Princeton University, a CNN contributor, and a fellow at New America.